Syria is still ablaze. Yemen has yet to sever the tentacles of the Saleh regime, and Libya remains in the chaotic throes of tribal fissures and militia violence. Tunisia is the only “Arab Spring” country that is transitioning to democracy wisely and pragmatically. Although dictators fell, most of the old regimes remained intact. The re-emergence of the Mubarak-era dictatorship under General Sisi is the most vivid example. The uprisings in the past three years have rattled Arab dictators and forced Washington to reassess its relations with the region. Arab autocrats have fought the uprisings and resisted all efforts to redesign the decades-old social contract with their people. Four fell. Those who are still in power continue to inflict destruction on their countries and repress their citizens. Yet, some policymakers, talking heads, and academics in Washington and other Western capitals are myopically advocating reconciling with existing regimes, including the Syrian tyrant. Self-proclaimed regional experts are advising these policymakers that Gulf monarchies, for example, are stable and secure and should be embraced. Likewise, some of these experts are calling on Washington to engage the Egyptian military junta because, they argue, Egypt is the centrepiece of U.S. policy and interests in the region. 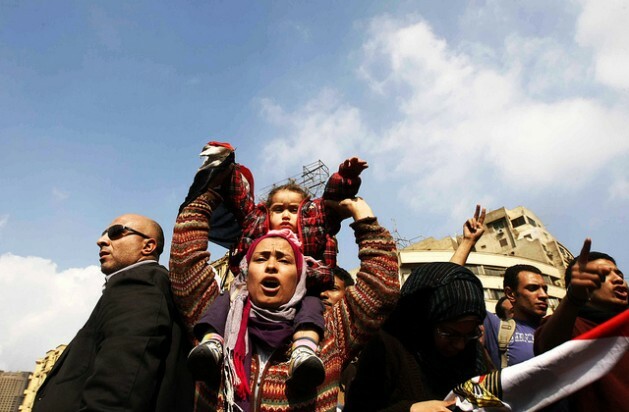 They maintain these interests should trump American values, which were trumpeted by President Barack Obama in his initial support of the anti-Mubarak revolt. This “expert” advice reflects a shortsighted, shallow knowledge of the region and is devoid of any strategic analysis of future relations between Arab peoples and their rulers. If followed, it would harm long-term U.S. interests in the region. Let us remember that three years ago, many of these experts missed the Arab Spring all together, as was pointed out in the 2011 Stimson Institute’s Seismic Shift report. Many academics and journalists paid scant attention to endemic grievances in Arab societies and focused instead on the “deep state” narrative, which they bought from the regimes hook, line, and sinker. A few distinguished U.S. journalists, such as the late Anthony Shadid of the New York Times, were aware of what was boiling below the surface in places like Egypt despite the glossy mask of stability that Mubarak and his fellow autocrats presented to the outside world. It is unfortunately understandable that some policymakers and academics are leaning toward accepting this narrative now because they are becoming disgusted with the bloody tumult across the region and the rise of radicalism and terrorism. Some academics similarly are trumpeting the “stability” narrative, especially in the Gulf. These “access academics” — who forego serious analysis of regimes’ repressive policies in order to be allowed into those countries and meet with officials — are repeating the same analysis they offered before the revolutions of 2011. In the Gulf monarchies, as the British academic Christopher Davidson of Durham University has pointed out in his book “After the Sheiks,” the absence of legitimacy, continued repression, and sectarianism will hasten the collapse of these tribal regimes. Professor Davidson maintains some academics, retired generals and sitting and former diplomats are peddling the “stability” fiction for potential access and economic gain. Promising business deals, lucrative post-retirement jobs, country visits, and Gulf investment in European and American university buildings are even influencing the type of research, analysis, and academic conferences that are being conducted on the present and future of Gulf monarchies. Fortunately, some scholars such as Toby Matthiesen of Cambridge University are seriously assessing the long-term destructive nature of bloody sectarianism across the region, which for the most part is being pushed by regimes. Several factors are driving this pernicious phenomenon. First, although dictators fell, most of the old regimes remained intact. The re-emergence of the Mubarak-era dictatorship under General Sisi is the most vivid example. The military junta’s harsh sentencing of Ahmad Maher, Ahmad Duma, and Muhammad Adel — key activists in the January 2011 revolution — and the espionage charges against two of Egypt’s most prominent intellectuals, Emad Shahin and Amr Hamzawy, signal that the deep security state is alive and well in Egypt. The military’s harsh crackdown against all opposition–secular and Islamist–belies its claim that Egypt is on the road to democracy. The recent branding of the Muslim Brotherhood as a “terrorist” organisation moves Egypt away from political reconciliation, the new “constitution” notwithstanding. In fact, the recently ratified document enshrines the power of the military as an institution impervious to any form of accountability. The politically motivated capital crime charges against the deposed President Mohamed Morsi and other Muslim Brotherhood leaders underpin the vengeful anti-democratic policies of General Sisi. Despite flagrant human rights violations and sham trials, the Obama administration is tragically maintaining its military aid to the Egyptian military. Furthermore, the U.S. State Department has withdrawn the name of Robert Ford as ambassador designate to Egypt from consideration in response to objections from the Egyptian military, according to media reports. Second, the authoritarian regimes that are still in power are employing comprehensive hard and soft power tools, violently and viciously, in order to keep their rule. Bashar al-Assad has rendered his country a wasteland, killing over 130,000 Syrians and forcing millions to become refugees in an attempt to defeat the opposition. Much like Egypt’s Sisi, he is feverishly trying to convince Washington and other Western capitals that he is the most effective force against terrorism and (Saudi) Wahhabi extremism. His foreign minister has repeatedly stated that if Western leaders hope to keep Salafi jihadists from overrunning Syria, Assad is their man. It would be tragic if Washington falls for this ruse. It was Assad who worked closely with radical Salafis first in Iraq and then in Syria. He had hoped Salafis would discredit the moderate, secular opposition — a self-fulfilling prophecy he is happy to see come to pass. Third, as these regimes fail to defeat their popular revolts and reject meaningful dialogue with the opposition, radical elements and Salafi jihadists begin to fill the power vacuum in Syria, Iraq, and elsewhere. The ensuing stalemate is already producing more turbulence, anemic economies, debilitating uncertainty, and diminishing personal security. No winner will emerge in the foreseeable future, which hopefully would force Washington to make hard choices. Simply put, these choices involve drawing a morally palatable balance between values and interests. If Washington hopes to be on the right side of history, interests should never be allowed to trump values of good governance, certainly not in the wake of the Arab uprisings of 2011. Why would anyone be surprised by the fact that US are willing to support ruthless dictatorships as they have always done in defense of their own interests? Isn’t that what they did on South America from the 1960’s to the 80’s? What’s the difference? Who would be such a fool to believe anyone but US is interested in fighting radical islamism? What’s the difference to those cold war years when they thought they could stop communism anywhere in the world and we should be thankful while they got even richer by doing it? Screw american interests and let Arabs sort they problems out by themselves. The USA should back off and let these Arab idiots kill each other off! !Most cases one side is no better than the other!! It doesn’t matter whom is president of the US or which Dictator they back, it does seem that it is always in the interest as to what the US can gain. It does appear to many countries that it is the US, and Israel that keep stirring up the Arabs.